Every company is claiming to be green in some way or another these days. For someone not versed in green matters, or even for many of us who think we are versed in it but actually may not be (at least on some issues), identifying who is truly green and who is not can be really difficult (or inaccurate). As much as environmental issues can be complicated and confusing, environmental issues concerning technology can be even more so. Can you say which is a greener IT company, Dell orGoogle or HP? Probably not. 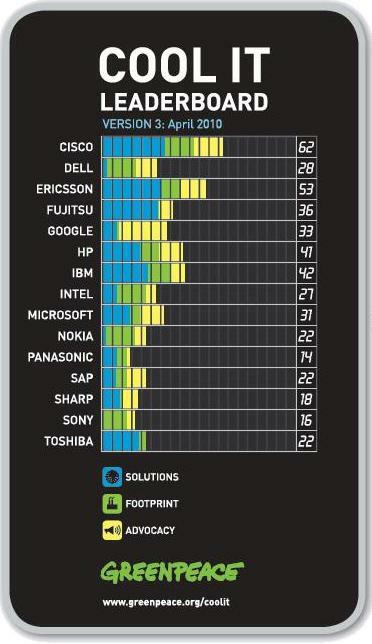 Luckily, Greenpeace has decided to tackle this issue and rank IT companies according to how green they are. As far as looking into the complete environmental record of a company or finding out hidden info, few are as good as Greenpeace. Of course, even for Greenpeace, it isn’t a piece of cake. A lot of information (e.g. amount of greenhouse gas emissions) is not available for many companies or not reported in the same way. Nonetheless, giving it their best shot, the following is Greenpeace’s ranking of major IT companies according to their work to be green, not just their words. Cisco, due to highly effective greenhouse gas solutions, smart grid technology and office energy management, is a surprising leader in the field now. It doubled its score from Greenpeace’s previous ranking in this one. Google, which came in sixth, is one I would have expected to have a higher ranking, but the reasons for it not coming in higher are clear. Despite strong political advocacy for clean energy and its own efforts to develop breakthrough solar energy and smart grid technology, Google has not set any emissions targets of its own and does not release or disclose its own emissions. “This lack of transparency puts Google significantly out of step with most other technology companies, and weakens its ability to be an effective advocate,” Greenpeace reports. Agree with these rankings? Have other info you would like to share? Comment below. This entry was posted in Eco Friendly Products, Innovations & Technology and tagged energy management, Greenpeace, IT companies, to be green. Bookmark the permalink.